CANBERRA, Australia — The prime minister has signaled that he could accept New Zealand's longstanding offer to resettle 150 refugees exiled to Pacific islands as long as the Australian Parliament legislates to ban them from ever setting foot in Australia. 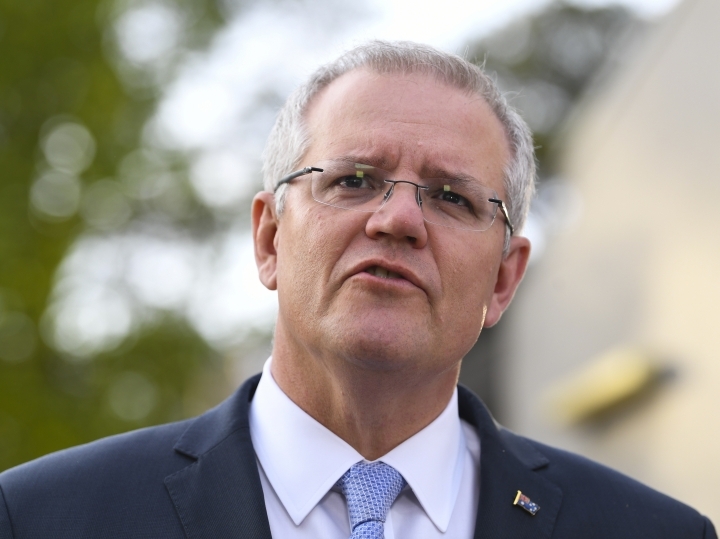 Prime Minister Scott Morrison said on Wednesday he was willing to brief non-government senators on the travel ban bill. "There is no support for that bill at present," Morrison told reporters. The center-left opposition Labor Party argues that a lifetime ban on refugees ever visiting Australia on a tourist or business visa was unnecessary and against Australia's interests. The policy has effectively ended the people smuggling traffic, but concerns are mounting over the fates of hundreds of asylum seekers languishing in an immigration camp on Nauru and male-only facilities on Papua New Guinea. Morrison's policy shift could also be influenced by a crucial by-election in a progressive Sydney electorate on Saturday. At stake is the government's single-seat majority in the House of Representatives and Morrison's ability to govern without doing deals with independent lawmakers. Three government lawmakers have recently appealed to Morrison to accept families with children from Nauru so they can receive adequate medical care. The U.N. refugee agency last week called on the government to "urgently address a collapsing health situation" on the islands and immediately bring the asylum seekers to Australia. The United States has agreed to resettle up to 1,250 refugees from the islands. But only 462 had found new homes in the United States in the past 14 months, Refugee Action Coalition spokesman Ian Rintoul said. New Zealand citizens are allowed to live and work in Australia for life, a unique status the government fears banished refugees would use as a backdoor into Australia. The previous prime minister, Malcolm Turnbull, had said in March that Australia would not consider other options for resettling refugees until the United States fulfilled its commitment. Rintoul said a plane carrying 17 men from Papua New Guinea for the United States on Tuesday could be the last. "All the Iranians, Syrians, Iraqis and Somalis are being rejected, so America's taken pretty much all that they're going to take," Rintoul said. There were still 1,337 refugees and asylum seekers on the islands, a government statement said on Wednesday.